STAY Project Steering Committee Elections & More Updates! Solstice Greetings Stay Project Family! Tis' the season of short days and long nights, a perfect time for hunkering down to strategize and set intentions for the new year ––which is exactly what the STAY Project did this past weekend at the public workers union hall in Charleston, WV! STAY Project members, steering committee, and staff came together to reaffirm our vision and core beliefs, to think through some big questions we've been asking about member engagement and governance, and to set priorities for 2019 and 2020! 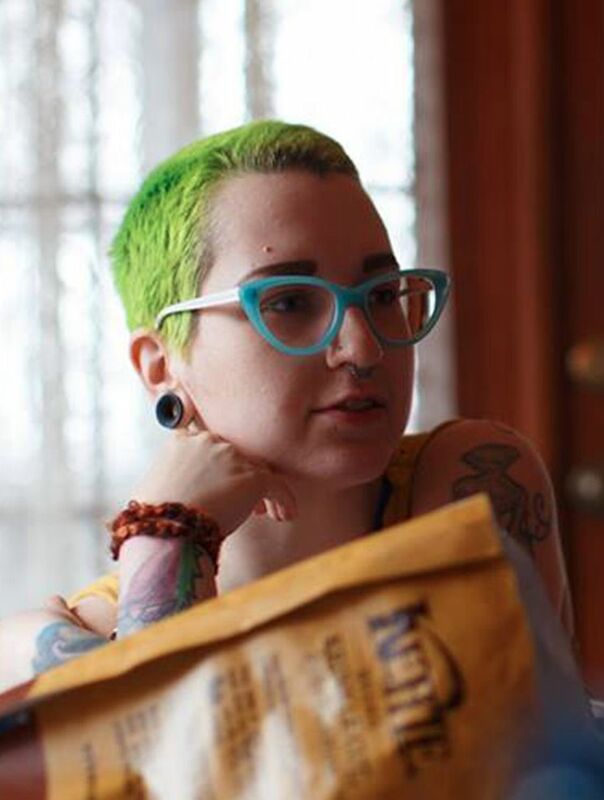 Some those priorities included making more spaces for members to engage in STAY's work in person and online, and a gathering just for youth of color in Appalachia. STAY is accepting nominations for the STAY Project Steering Committee! Find out more about that process in this newsletter! Also, be sure to read the letter from Lill about their experience being a STAY Project steering committee member. We decided that one of the ways to create more opportunities for our members to engage, beyond attending the STAY Summer Institute, is that we will be having monthly membership calls that will focus on skill building and connecting our membership to the resources they need. The first call of 2019 will be about what it means to be a member of the STAY Project and what resources are available to our members and it will be on Sunday, January 20th at 7pm. Register for that call here http://bit.ly/staymembership. To help us create more opportunities for our members to engage we need to know who y'all are! So if you have not filled out our membership form, please go ahead and do it today. If you have filled out the form but it has been awhile, go ahead and do it again to update your info. These are just a few small ways we are working on realizing our vision, and the STAY Project incredibly excited about what will take shape from the priorities we set for 2019-2020. As STAY heads into this new year with these priorities we will move like water –flexible, resilient, powerful and ready for what will need to change shape. Finally, we are so grateful for our STAY Project family for supporting and loving us in 2018 as we celebrated 10 years of building this Appalachian youth movement! The STAY Project wishes you a warm and restful December and don't forget that come winter solstice, each day will be a little lighter a little longer. 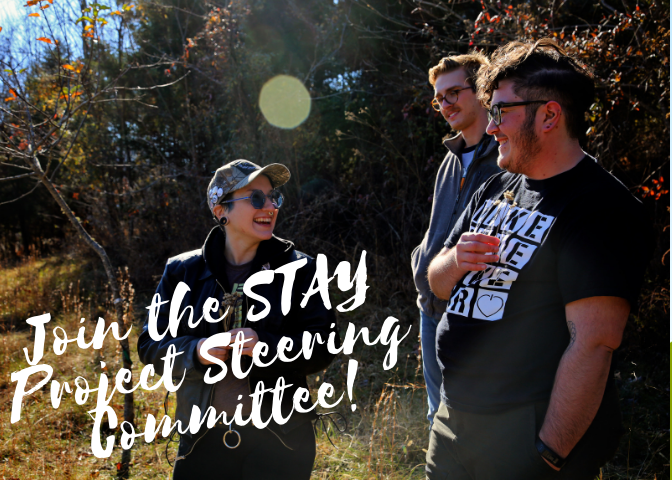 Join the STAY Project Steering Committee! We are looking for young folks between the ages of 14-30 from Appalachia who want to be a part of shaping the future of STAY! If you or someone you know is interested in applying for STAY’s Steering Committee, please take a moment to answer the questions in the document at the bottom of this page. We especially encourage youth of color, LGBTQ youth, and youth under 18 to apply. Go ahead and share this opportunity with other youth age 14-30 from Central Appalachia! The first Steering Committee Meeting of the year is February 15th -17th. Apply here! Nominations are due by 11:59pm on Monday, January 7th, 2019. Two years (and one extra month!) later, it is my time to go. So much has changed since fall of 2016, when I was elected to serve on the Steering Committee for the STAY Project. I’ve taught and learned, healed and struggled, and mostly, I think, figured out exactly why a youth liberation movement in central Appalachia is and has been crucial to me for so long. I’ve learned what it’s like to be heard and invested in, I’ve also learned when to step back and let others lead the way. I’ve helped to create a workshop about combating white supremacy and collective liberation in Appalachia, and dream to build a whole curriculum about how we- mountain youth, are the ones we’ve been waiting for, and we will be the ones to get us free. I hope you will take what you need from the work we’ve done for the last two years and leave the rest. I hope you will add to our work and make it better, stronger, and more resilient. STAY is about creating space, it is also about more than space, it’s a feeling, a movement, a thing you can carry with you wherever you go and take pride in being a young person who is trying to stay in this place (or about how you can leave the mountains, but your legacy will always touch down on and inspire your comrades here at home). I hope you will apply to join STAY’s Steering Committee because we need leaders like you NOW. I can’t wait to see what you’ll do. When you give to the STAY Project this #GivingTuesday you are nourishing a grassroots movement by youth and for youth in Appalachia. We could not do our work without the support of a community that believes in us. Thank you for believing in us!